Boston saw 70 degrees in February last week. Naturally, many of us are now ready for Spring. If you are a cyclist or have a child who rides, now is the time to get ready for a safe cycling season. 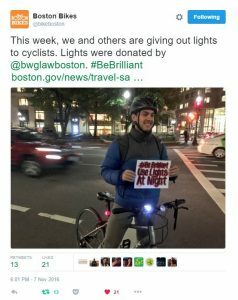 The attorneys of Breakstone, White & Gluck have long represented cyclists who have been injured by negligent drivers in Massachusetts. We are committed to preventing these bicycle accidents and reducing injuries. 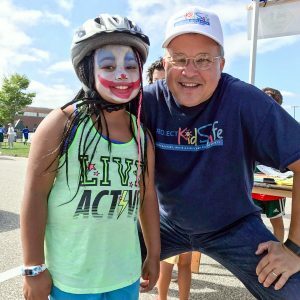 In a few weeks, we will begin the 6th year of our Project KidSafe campaign, donating bicycle helmets to children in Boston and other communities. 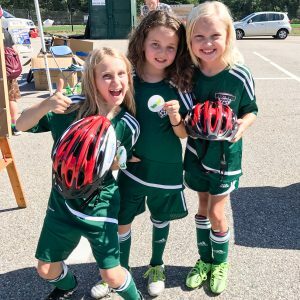 Bike helmets are critical to preventing concussions and traumatic brain injuries. And they are most effective when cyclists start wearing them at an early age with positive reinforcement from parents and other family members. We will share more on our campaign soon. For now, we have a few bike safety tips from our attorneys and the League of American Bicyclists to help you get ready for a safe cycling season. Tagged: "bicycle accidents", "bike helmets", "bike safety", "Boston bicycle accident lawyers" and "Boston personal injury lawyers"
For the fifth year, the Westwood Pedestrian and Bicycle Safety Committee had one of the busiest tables at Westwood Town Day, which was held on Saturday, Sept. 23 this year. Breakstone, White & Gluck donated 150 bicycle helmets from our Project KidSafe campaign and sent Attorney David W. White out to help fit helmets for the kids. Attorney White is a Westwood resident, former committee member and cyclist so he had a blast. Thank you to all the committee members for donating their time. Children age 16 and younger are required to wear helmets when riding a bicycle in Massachusetts. Breakstone, White & Gluck recommends cyclists of all ages wear helmets every time you ride to protect yourself from a head injury. If you are a parent, your children are more likely to wear a helmet if you do, so it is even more important. Learn more about our Project KidSafe campaign. Thank you to the Cambridge Police Department for fitting bike helmets for the kids at Rindge Tower Apartments. 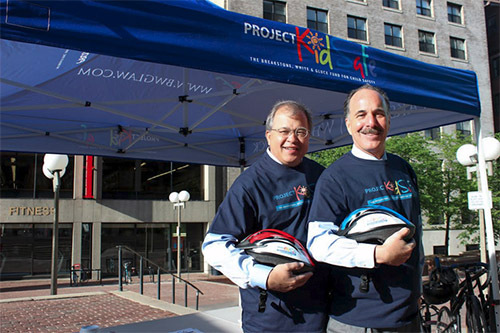 Breakstone, White & Gluck donated the helmets as part of our Project KidSafe campaign. Just-A-Start, a community development corporation serving Cambridge, treated families at the Rindge Tower Apartments to a Community BBQ with all the best fixings of summer last week. From hot dogs, hamburgers and snow cones to bouncy houses, music and conga lines, the gathering drew more than 150 people from the 273-unit apartment building near Alewife Station. 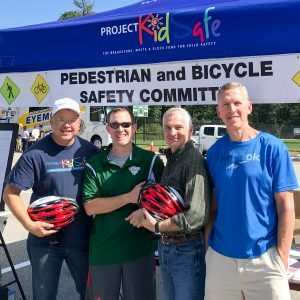 The Cambridge Police Department participated, distributing safety materials and free bicycle helmets from Breakstone, White & Gluck’s Project KidSafe campaign. Officers distributed and fitted over 80 helmets for children. We want to share a few photos from our Project KidSafe campaign. Dedham Bike Rodeo. 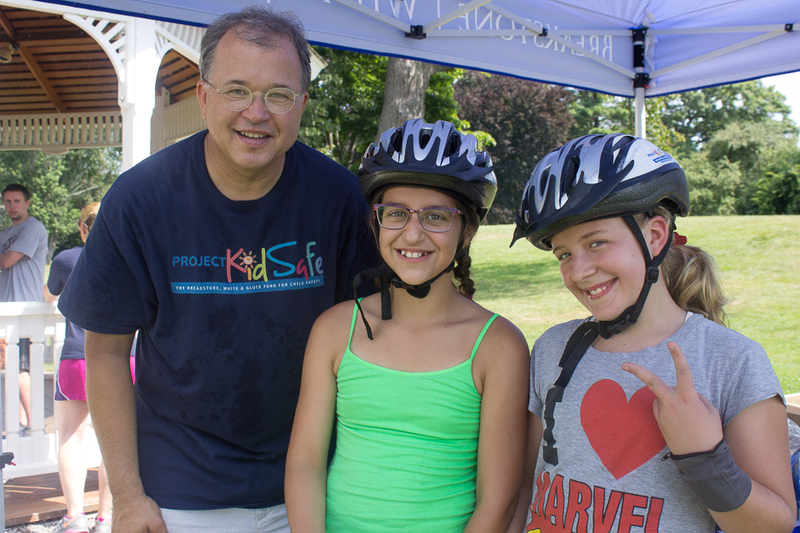 Breakstone, White & Gluck was pleased to donate 120 Project KidSafe bike helmets to the Dedham Bike Rodeo on July 26. Attorney David W. White participated in the event, fitting helmets for children who needed one. We always enjoy this event because we get a chance to talk to children and parents about bike helmets and bike safety. It was one of the first events we donated helmets to in 2013, the year we began our Project KidSafe campaign. The rodeo is organized by the Dedham Police Department and the Dedham Parks and Recreation Department. Mattapan on Wheels. 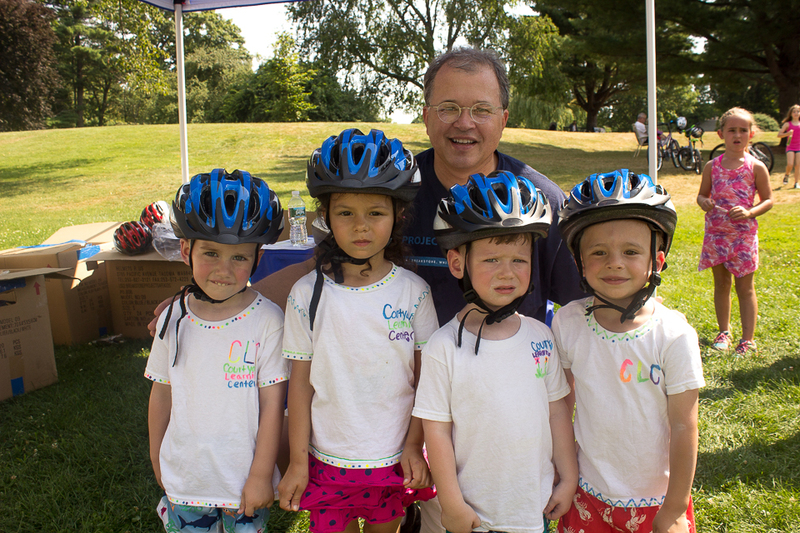 Breakstone, White & Gluck also donated helmets to cyclists at the 7th Annual Mattapan on Wheels event on July 22. We are told 130 cyclists took to the Neponset Trail to raise funds for a youth bike summit and many had no helmet or needed a new one. Participants could choose their destination and ride along the trail to Pope John Paul II Park, Carson Beach or Castle Island. This was the first time we donated helmets to this event and we are told every helmet was put to use. Photo Courtesy: Quincy Police Department Facebook Page. 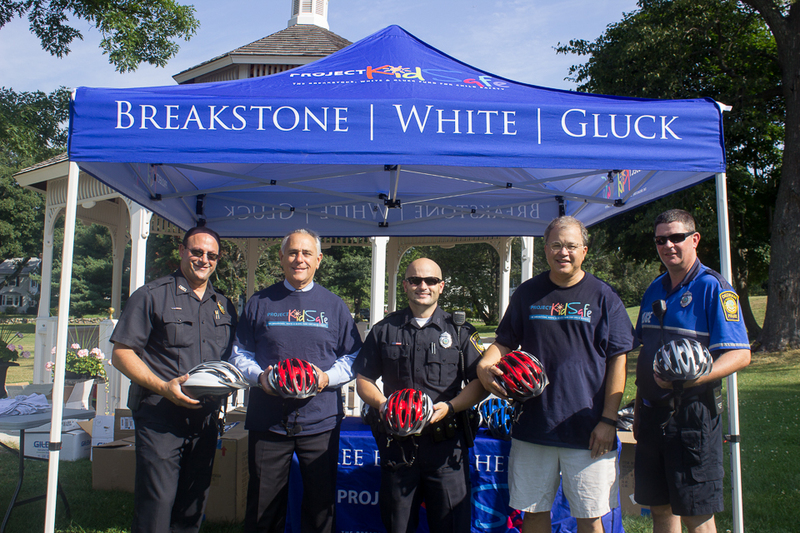 Breakstone, White & Gluck and our Project KidSafe campaign recently teamed up with Quincy Police to donate 100 bike helmets to fifth graders. 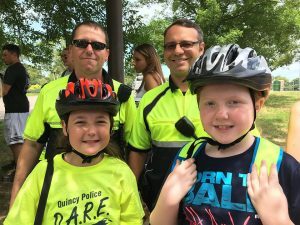 On a bike, wearing a helmet is the most important step, Quincy police officers said yesterday. Breakstone, White & Gluck and the Quincy Police Department teamed up to give away 100 new bike helmets on Monday, during the department’s annual D.A.R.E camp at Pageant Field. But first, Lieutenant Bina and other bike safety officers shared tips for riding safely. Attorney David W. White (center) with William G. Gross, Superintendent-in-Chief of the Boston Police Department (left) and Sgt. Gino Provenzano (right) of the Boston Police Department. 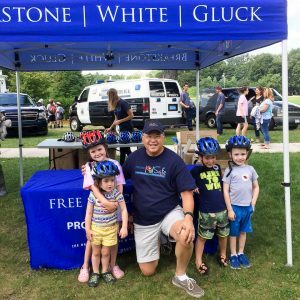 Breakstone, White & Gluck was pleased to donate 200 bike helmets to the Boston Police Department this summer to help kids ride safely. 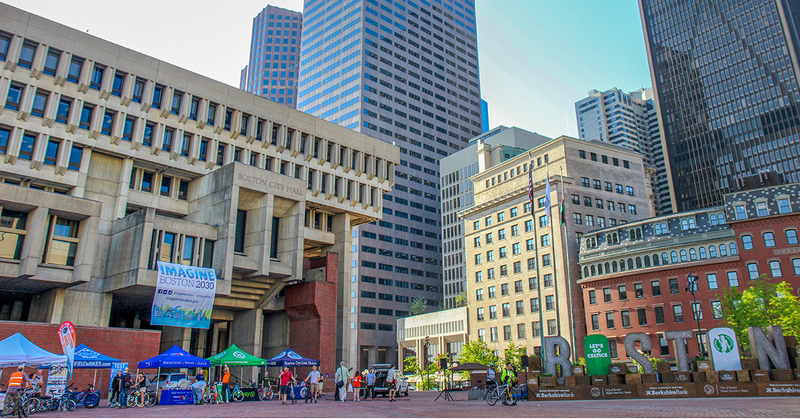 Breakstone, White & Gluck and our Project KidSafe campaign are proud to partner with the Boston Police Department to keep children safe on bikes. 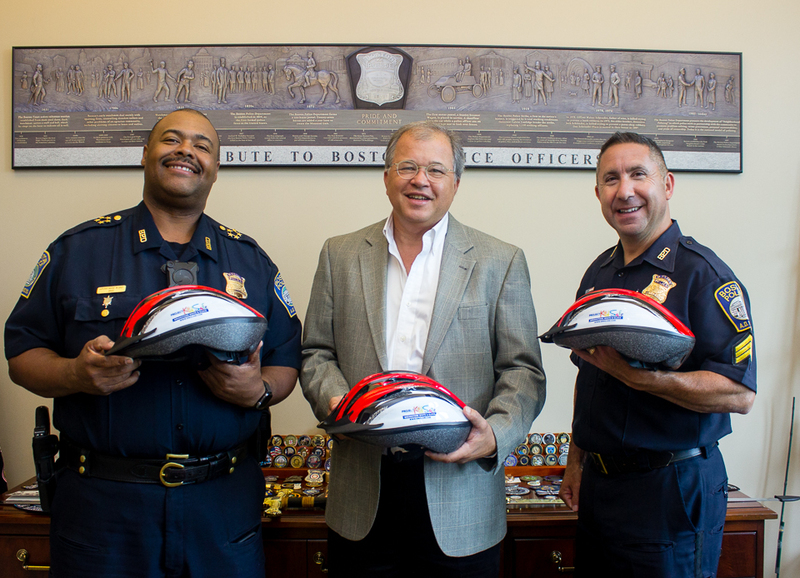 Our attorneys recently donated 200 brand-new bicycle helmets to the Boston Police Department. Over the summer, officers will give helmets away to children who need one as part of the department’s community policing efforts. 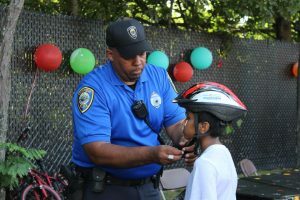 So far, officers have put new helmets on children at the Villa Victoria Bicycle Safety Day, the Dorchester/C-11 Bike Rodeo and at the Condon Community Center in South Boston. These events are meaningful because kids get more than a new helmet. They get the opportunity to learn about bike safety and meet a police officer in their own neighborhood in a fun, relaxed setting, building trust and community relationships while learning how to ride safely and protect themselves from head injuries. Breakstone, White & Gluck returned to the Dedham Bike Rodeo yesterday for the third year in a row. We were happy to donate 120 new bicycle helmets to the kids at the rodeo. Photo: Attorneys Ronald E. Gluck and David W. White of Breakstone, White & Gluck with Dedham police officers, including Neil Cronin and Bob Nedder. Photo: Attorney David W. White with Isabella and Jessica, both 11. We have fit them for helmets in the past and this year, they were thrilled to fit into our largest size. Photo: Attorney David W. White with 4-year-olds from the Courtyard Learning Center in Dedham. 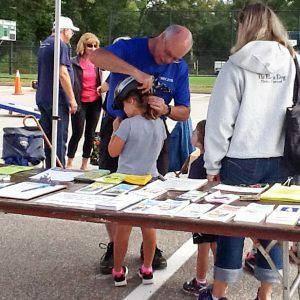 The Dedham Bike Rodeo was one of the first events we participated in after starting our Project KidSafe campaign in 2013 and we always look forward to it. It is an annual event organized by the Dedham Police Department and Dedham Parks & Recreation Department. Local children are invited to ride around at the Endicott Estate, then offered a free lunch. The Dedham Police Department raffles off free bicycles to a few lucky children. For the finale, the Dedham Fire Department brings in the hose truck and lets the kids run under the water to cool down. That was much needed yesterday, with the temperature over 90 degrees! Attorney David W. White fitted the children for new bicycle helmets and talked to them about the importance of always wearing one. A child who wears a helmet significantly reduces their chance of suffering a traumatic brain injury in a bicycle accident. In Massachusetts, wearing a bicycle helmet is also the law for children and teenagers 16 years old or younger. David has fitted some of the Dedham kids two or three times now over the years and it was nice to see them back, willing to wait in line on such a hot day. A lot of helmets from years past were still being worn by other kids. Breakstone, White & Gluck donated the helmets as part of our Project KidSafe campaign, which we launched in 2013. To date, we have donated over 5,000 helmets and expect to reach 8,000 by year’s end. Our goal is to encourage children to wear bicycle helmets and ride their bikes safely. Even though it is widely known that bicycle helmets can protect cyclists, many children still do not wear them or use ones which do not fit properly or are in poor condition. It is important for children to wear helmets which fit properly and meet safety standards. Children are especially vulnerable to bicycle-related injuries and deaths, accounting for half of all cyclists who are treated in emergency rooms each year, according to the Centers for Disease Control and Prevention. Some 26,000 children are treated for traumatic brain injuries related to bicycling accidents. We also encourage parents to always wear their helmets too. When children see their parents consistently wearing helmets, the use of helmets by children increases dramatically.